As new families apply for your school or program, you need to keep track of where these families are in your enrollment pipeline. 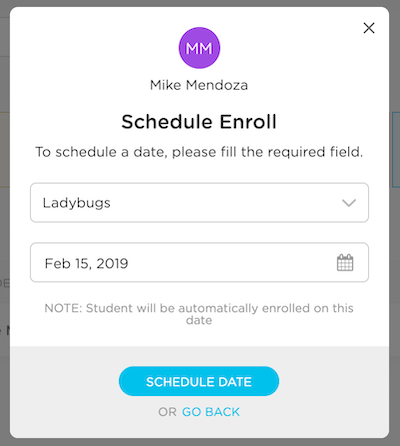 With Kinderlime's online enrollment form, you'll be able to have parents fill out an application, accept registration fees, and track where the families are as they go from showing interest in your program to becoming actively enrolled. Click on the button in the Status column to see the drop-down of all status options. Choose which status you would like to move the child to. Toured: Families who have physically visited your center or gone through preliminary steps for enrollment. Interested: These families have shown a definite interest in enrolling in your center but have not confirmed / reserved their spot yet. Waitlisted: Families who would like to be enrolled or have paid to reserve a spot, but there is currently no space to enroll their children. Admitted: Families who have received a spot at your center but will not start immediately. Enrolled: These children will be moved into the My School > Students section of the website and are no longer part of your enrollment pipeline. However, you can still access their enrollment form information here. 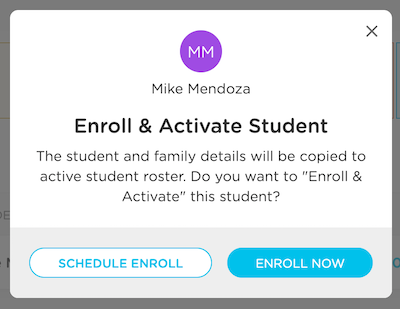 When changing a student's status to Enrolled, you'll have the option to enroll them immediately or schedule their enrollment for a specific date. The student will be automatically copied over to your active student roster on the selected date.